Toyota has been whole 17 years absent from dirt and dust of World Rally Championship, and this is the year of its return. 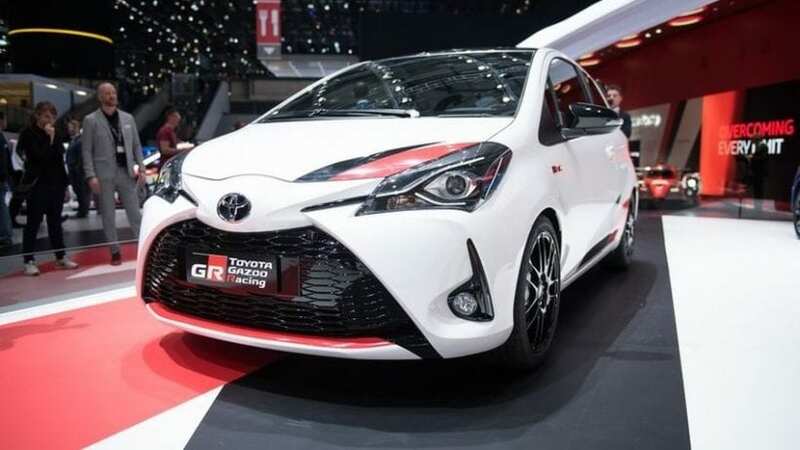 To properly celebrate such a big happening we were all treated with 2018 Toyota Yaris GRMN at recently held Geneva Motor Show. It is obviously hot hatch and what is not obvious is the meaning of GRMN. It supposedly stands for Gazoo Racing Masters of Nürburgring, hinting that Gazoo Racing had to do something with it and that it was developed on famous Green Hell race track, as all of them does these days. Gazoo Racing is, by the way, the team that leads Japanese comeback to the WRC. And no, it’s not the first spicy Yaris by Toyota, as we had TS badge with the previous generation and even before that. Though 130 hp was quite trailing behind much hotter competition at the time and Japanese brand honestly missed to treat us with visual delicacies that follow that type of badge. The story is a bit different this time, so go ahead and label this as first “proper” “mini” hot hatch by Toyota. We said “mini” due to the respect we have for properly powered supercharged Corolla T-Sport hatch offered briefly a decade ago. As we mentioned, previous Yaris with sporty pretensions had a certain lack in hp number compared to Polo GTI, Fiesta ST and especially Clio RS, while this one is about to top them all as far figures on paper are concerned. Also, this time visual side of it is better covered, and finally we ended up with the complete package from the Toyota. At first glance, 2018 Toyota Yaris GRMN looks menacing, but at second you’ll see that nothing was changed on the fascia. Gapping grille from regular Yaris is well enough threatening, but we should hold a grudge because at least grille meshing could have been unique to this version. Luckily Japanese engineers implemented some black and red stickers as an homage to the rally car, giving enough flair to the front side of it. From the profile, we sadly don’t have special skirts, but we do have unique deep black, double-spoked alloy wheels as well as more of red and black decals. Back is a different story, as Japanese had let loose some steam with a sporty diffuser, center positioned large exhaust tip and fairly big, roof-mounted rear wing. Mirrors and roof are painted black, though you can get that with normal Yaris, but you can’t get GRMN fender badges. In total, front fascia could have used more special touches, but nevertheless, the overall impression is satisfying for the first time. Even if you could say that previous sporty versions of Yaris did have at least some visual flamboyance, you definitely couldn’t state that for their interiors which had nothing to separate them from regular variants. Toyota came to their senses this time, and we have special steering wheel resembling one from the GT86 model, extremely high bolstered sports seats, aluminum pedals and some additional badging. 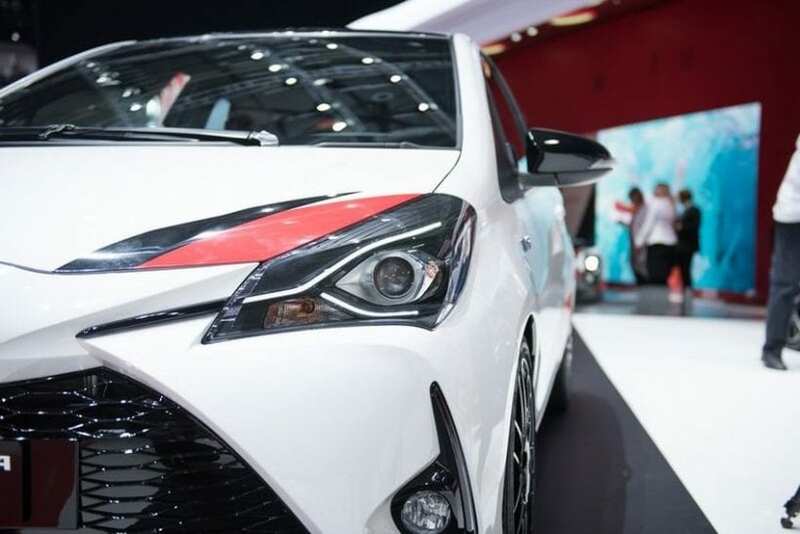 For the first time, hot Yaris is not going to blush when faced with competition. Toyota promise above 207 hp which trumps all competition apart from Renault Clio Trophy version and its 223 hp. Most interesting thing is the fact that mentioned power is produced by the help of supercharger in a world of turbocharged hot hatches. Exact hp figure is not yet disclosed as well as acceleration time, but the carmaker state best in the class so it must be in low six seconds area to prove that. It doesn’t all end with horsepower, as “N” letter at the end of GRMN moniker should explain its existence with reinforced chassis, Torsen LSD, upgraded brakes, tuned suspension with shorter springs, Sachs dampers, and larger front stabilizer bar. For the first time, yes, or at least consider it as a proper choice next to well-established rivals. 2018 Toyota Yaris GRMN is probably going to be priced between £18k and £19k in the UK ($23k-$24.5k), same as other rivals. So, for the first time sporty Yaris is as hot looking as Fiesta ST, Clio RS, Polo GTI, Corsa VXR and Peugeot 208 GTi and for the first time, not just that it’s not underpowered anymore, it is supposed to surpass almost all of them in that area.